The iconic Mehboob Studios in Mumbai witnessed Asia’s biggest celebration of blues music with the 7th Mahindra Blues Festival oranized by Oranjuice Entertainment. Each year, the festival has treated its fans to an extraordinary set of blues music providing soulful singing. 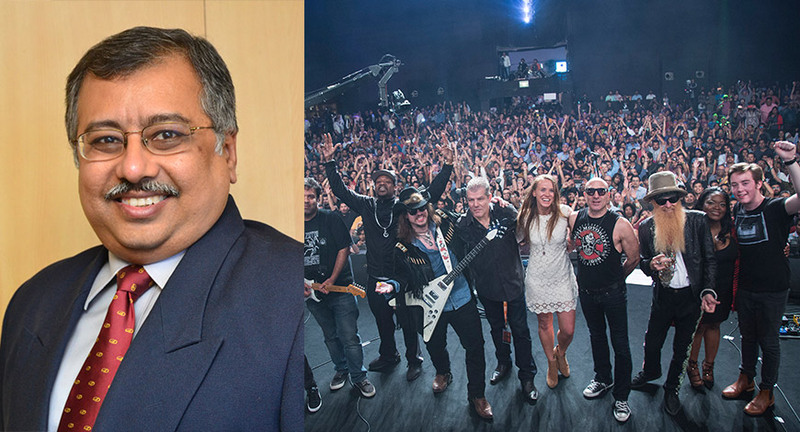 This year was no less; with high expectations of a blues fiesta, the festival got off to a flying start with the musical stars, with a key focus in Mahindra’s commitment towards sustainability. In an interview with EE, Anirban Gosh, Mahindra’s Chief Sustainability Officer talks about Mahindra’s going green initiative, where each and every element of the festival was organised keeping the environment as the priority. Excerpts from his interview. Q1- Mahindra Blues Fest this year claimed to be a sustainable fest, tell us how you have achieved this? Sustainability and environmental consciousness has always been a part of Mahindra Group’s ethos. Mahindra Blues Festival has taken a number of measures through the years on different aspects of Sustainability. At the festival this year we worked on distinct aspects that touched upon Sustainability. To ensure the active particiation of people, creative banners were put up across the venue to educate the attendees about the importance of proper waste disposal and recycling. The bins had clear segregation signage (dry waste & wet/organic waste). The dry waste – such as papers, plastic, cardboards, metal, glass were sent to recycling centers. The biodegradable waste was processed in compost pits, OWC machine or Biogas. The operations were carried out by trained workers and all the work was closely monitored by a supervisor from the NGO we partnered with for the program. It ensured the maintenance and collection of the waste. Secure lockers and stands provided for cycles at the parking spot encouraging guests to ride their cycle to the venue. These initiatives were taken as a conscious decision to make our festival green, the Platinum level Yale certificate was just one of the outcomes of this effort. Q2- Mahindra Blues Festival just became a Yale certified Platinum level green event what does this mean? As a company we promote sustainability as a personal endeavor. So, we decided to apply this to our festival as well and the steps that have been listed above was work towards the same. The platinum level Yale certificate actually helped us pool together the things that were a must do and so was a huge plus towards making our event green. We are now looking at future events within the company that we can work on from the green lens. Q3- Talking about sustainability, what are the further steps you will take to ensure the same? Besides taking the initiatives that we have taken this year we are also looking at initiatives like printing tickets on environment friendly paper or using the smart technology towards optimum usage of resources at the venue. Q4- Are there any specific steps you have taken to ensure recycling and waste management? For both the days waste was segregated in wet and dry categories on the spot. Further the mixed dry waste got segregated in different categories in our partner NGO’s sorting centre like: white paper, colour paper, shredding paper, LD plastics, HD plastics, glass and reject. Once the final segregation had been done the same waste was sent to recycling units. The reject waste was handed over to Municipal Authorities as required. All the procedures for a zero waste to landfill program were followed. The toilets at the venue were portable cabin type, we are always on the lookout for adopting technology that will be greener thus ensuring that our event while entertaining our guests also takes care of the environment.